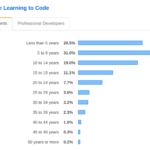 Stack Overflow has just released their survey. Turns out I am the 1.0%. If you are in the 20.5% and looking to trade, I’m game.